Our first full day in Ushuaia, the Southernmost city in Argentina, South America, and the world, featured two activities included in the G Adventures tour. In the morning, we took a wonderful cruise around The Beagle Channel, and the afternoon was dedicated to walking among three different species of wild penguins. The second full day afforded us the opportunity to branch out, and choose an optional activity, of which there were many. Or one could relax with spa treatments, shopping, or visits to the local museums. Everyone in our group chose to go for the guided walk in Tierra del Fuego Park, combined with an hour or two of sea kayaking. This was perhaps the most budget-friendly option, however we'd already hiked in some amazing locations, and I wanted to do something to get my adrenaline pumping. 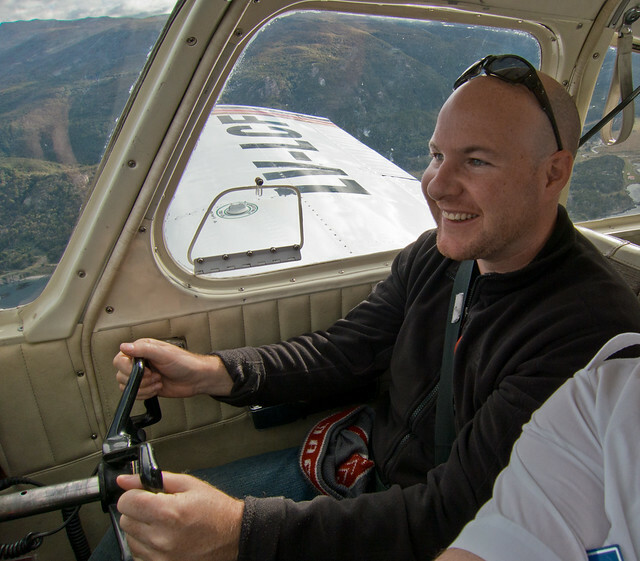 The resulting adrenaline rush was much more than I bargained for when the pilot of a Piper Cherokee 140 gave me the controls in order to take photos of me flying the plane. 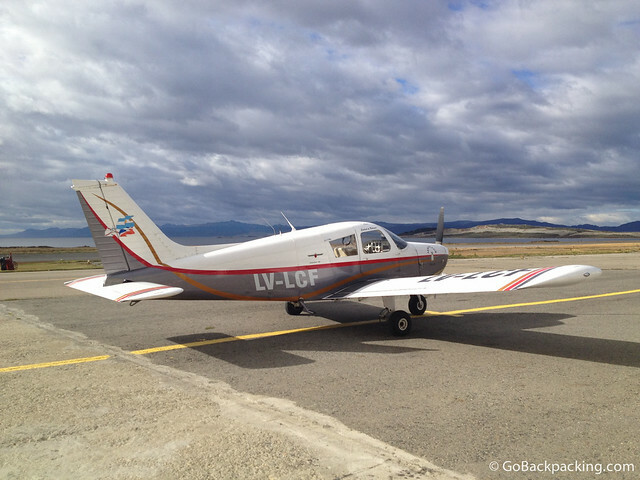 Christian, our G Adventures guide, had booked a 1-hour scenic flight for me through Aero Club Ushuaia. While the cost of $180 may seem steep, I actually thought it was a bargain, especially considering it'd be a private flight. Had at least one other person joined me, the cost would've been a real bargain at $90 per person. Helicopter flights were more than double, around $400 per hour. I took a taxi from the hostel to the old airport, which I'd soon realize was a short 20-minute walk away. It was literally visible from the hostel, which was perched on a hill. My flight time was 10 AM, and that's about when I met Carlos, a systems engineer by trade, and a hobby pilot in his spare time. He'd been flying for five years, and spoke little English. 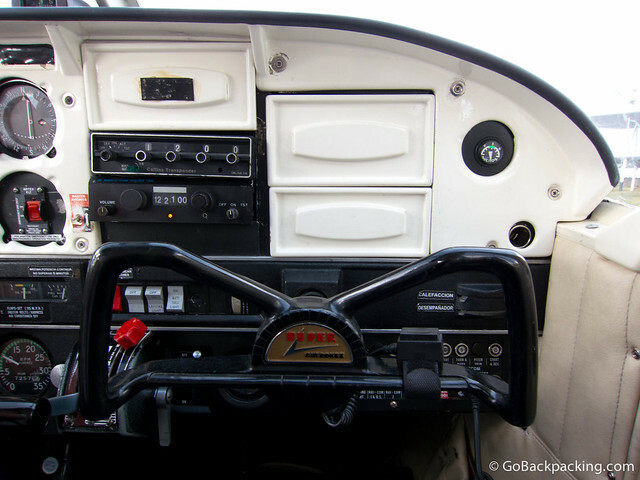 Stepping onto the wing, and into the copilot's seat, I was feeling plenty nervous. My only previous experience in a small plane, a 5-seat Cessna, was a scenic flight over the Okavango Delta. That ride was just 45 minutes, but it was an epic experience watching large groups of elephants march down the plains. 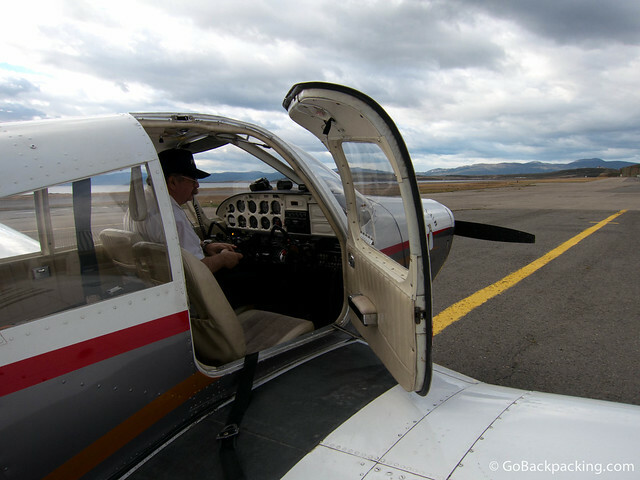 Once I was buckled in properly, Carlos did his pre-takeoff check, and I took out my camera. I knew if I kept myself busy taking photos, it'd take the edge off. 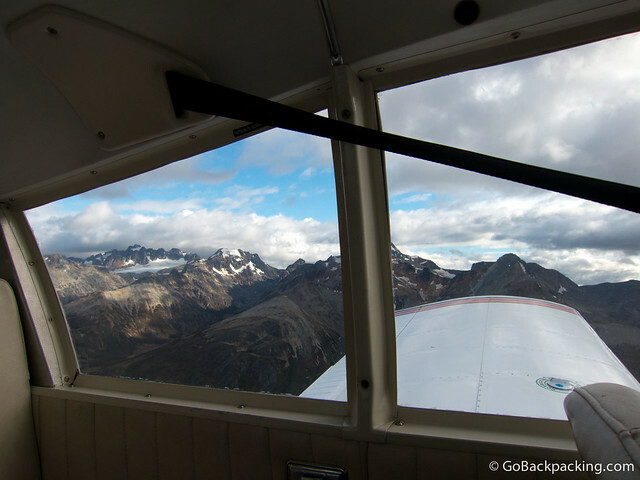 The takeoff went smoothly, and we were soon soaring up to the level of the surrounding mountains. I forgot to ask our cruising altitude, but it was below the clouds for the whole flight. Despite the overcast skies that greeted us that morning, we actually had clear views of the nearby mountains and glaciers. Carlos warned me that we might experience some turbulence, however we would change our flight path if it became a problem. I appreciated the warning, and prayed we'd have a smooth ride. I took at least a hundred photos during that hour, switching between my camera and iPhone. 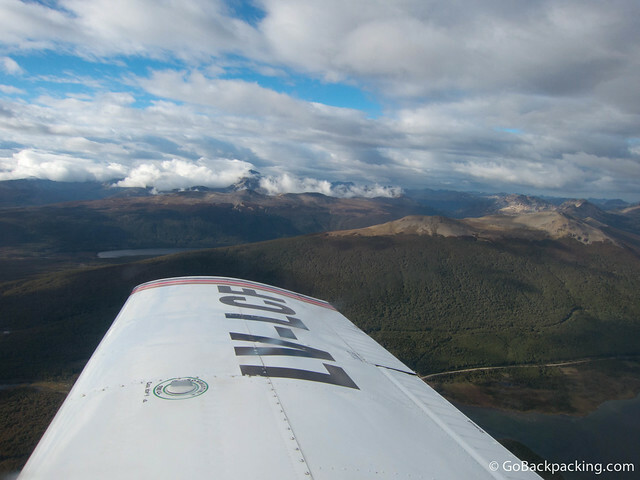 The first half of the flight was through the mountains, after which we made a loop and began flying back to Ushuaia over The Beagle Channel. It began to drizzle lightly, but aside from feeling the normal movements of the plane, there was no turbulence. With about 20 minutes to go before we arrived back in Ushuaia, Carlos told me to grab the copilot's controls and hold them derecho, which means straight in Spanish. He then motioned me for my camera. Holy crap, I'm flying a plane! Hurry up and take the friggin' picture! What would happen if I made a sudden, hard turn left or right? Could Carlos recover the controls if we entered a death spiral toward the water below? Thankfully, he resumed control after I made sure there was at least one photo of me smiling. 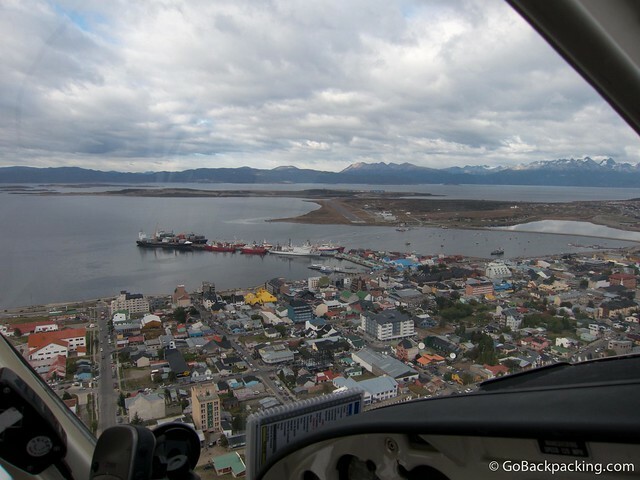 The mountains were nice, but our approach over Ushuaia was the most interesting part of the flight for me. It's not a big city, so it's easy to get your bearings from above. As we touched down on the tarmac of the old airport, it seemed awfully bumpy. Definitely in need of a re-paving. Adrenaline rush over, I was beyond grateful to be back on terra firma. When I said this to Carlos, he responded by pointing upward, and saying he was more comfortable in the sky than on the ground. How Much: $180 + tip (cash) for a 1-hour flight. Price is per plane, therefore it's $90 per person for 2 passengers. Shorter, 30-minute flights are also available. 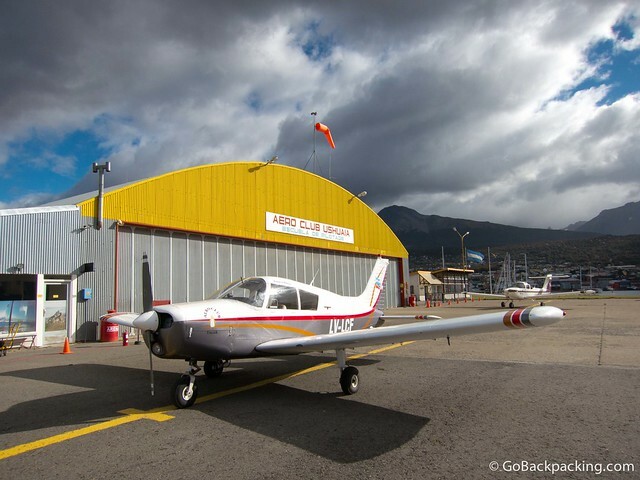 Where to Book: Through your accommodation, guide if traveling with a group, or directly with Aero Club Ushuaia. What to Bring: Camera and sunglasses. I was going to get my pilot’s certificate in US and my first and only trip in the small Cessna scared me. When we were around 15′ off the ground after take-off this dread came over me. I was thinking, put the plane back on the ground, but I did not say anything. Funny, I’m OK with flying 737s, but the little planes scare me. I guess I’d eventually get over it. Even taking a tram, I will position myself and get low to the floor. I’ve had the same thought, but I guess it’s just the thrill of the ride that lead me to take another scenic flight. An hour is a long time. I would’ve been satisfied with 30 minutes.